it's biggest city. First impression of it - Monuments. There are too many of them. for one day to feel it. The biggest Old Bazaar in the Balkans is here. Skopje is the capital of the Republic of Macedonia and is the largest and most diverse city in the country. The territory of Skopje has been inhabited since at least 4000 BC; remains of Neolithic settlements have been found within the old Kale Fortress that overlooks the modern city centre. The settlement of Tumba Madžari is a protogenic core of today’s City of Skopje. Archeological findings at the prehistoric settlement Tumba Madzari are evidence of material and spiritual, high artistic and aesthetic values of the Neolithic man from Macedonia, taking place in the period between year 6000 and 4300 BC. Today City of Skopje in the 1st century B.C.E. under the name of Scupi was prized for its strategic location, located between Zajčev Rid and the Vardar River, several kilometers from the center of Skopje, a vital trade route. Scupi grew up as colony of legionnaires, mainly veterans of the Legio IIV Claudia in the time of Domitian (AD 81-96), even though several legions of Crassus' army of 29-28 BC, may already have been stationed there, before the official imperial command in this area was instituted. From 272 AD, it was a colony inside the Roman province of Dardania after Dardania was established. Under the Romans, Scupi was made administrative center and seemed to become a city of some prestige. Scupi was included in Moesia Superior after the province was formed in AD 6. Scupi was ravaged several times by barbarians, in AD 269 by the Goths, in 5th century by the Huns and finally in the year 518 was completely destroyed by an earthquake. Life in Scupi stopped after the earthquake and the people from Scupi moved to live on Kale, a hill in the center of Skopje. It is connected with the founding of Justiniana Prima. Byzantine Emperor Justinian (527–65 AD) was born in Tauresium, a town situated roughly 20 km southeast of present-day Skopje, in 483 AD. After Scupi was almost completely destroyed by an earthquake in 518 AD, Justinian, according to his historian Procopius in "De Aedificiis" (On the Buildings), built a new city near his birthplace Tauresium and Bederiana (believed to be today's villages Taor and Bader) at the fertile entry point of the River Lepenec into the Vardar, making Skopje the city of Justiniana Prima. The city’s prestige grew when the Orthodox Church made it an episcopal seat during the early Byzantine Empire. It was celebrated for its urban life and fortress, and renowned for having the most beautiful churches in the region. In 14th century, Milutin's grandson, Stefan Dušan, made Skopje his capital. He later proclaimed himself Emperor of Serbs and Greeks in 1346, subsequently making Skopje capital of the Serbian Empire. At the very end of the 14th century, Skopje and all of Macedonia fell under the rule of the Ottoman Turks. In the ensuing centuries, the look of the town changed with the construction of many mosques, Turkish baths, bridges, and other buildings attesting to the new Oriental influence. Today, the Ottoman legacy remains extremely visible in Skopje’s Old Bazaar  Stara Charsija. After Macedonia was liberated from the Turks in the early 20th century, became a part of Kingdom of Serbia, Kingdom of Yugoslavia and then it became a republic of the Yugoslav Federation, with Skopje as the capital. At that time, the prosperous city boasted many ornate, Neoclassical buildings laid out harmoniously in a more or less Central European style. However, in 1963 a disastrous earthquake leveled much of the regal old city, and Skopje was reborn in the imaginative, futuristic style in vogue at the time. The plan was drawn by the Japanese architect Kenzo Tange, who also designed the new railway station. The plan was never fully carried out. Home to about quarter of the entire population of the country, it is also home to many different types of people. Besides the majority Macedonians, many Albanians, Turks, Roma, Serbs, Bosniaks and others call Skopje home. The city is spreading in all directions and is experiencing a number of new developments. 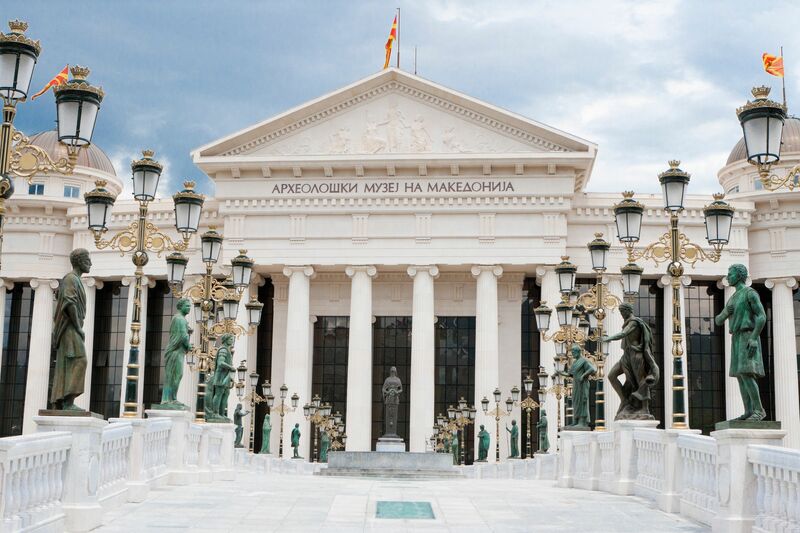 The government had launched in 2010 the "Skopje 2014" project which aims to give a more monumental appearance to the capital and has erected a lot of statues, fountains, bridges and museums in the city. Macedonia Gate is a triumphal arch located on Pella Square in Skopje. The arch is 21 meters in height and is dedicated to 20 years of Macedonian independence. Its outer surface is covered in 193 m2 of reliefs carved in marble, depicting scenes from the history of Macedonia. It also contains interior rooms, one of which has a function of state-owned souvenir shop, as well as elevators and stairs providing public access to the roof. Macedonia Square is the main square of Skopje and the biggest in Macedonia. It is located in the central part of the city, and it crosses the Vardar River. The Christmas festivals are always held there and it commonly serves as the site of cultural, political and other events. The square is currently under re-development and there are many new buildings around the square being constructed. In the center of the square, it is built a 22 meters high Monument of Alexander the Great riding his horse Bucephalus. The monument is in the middle of a circular fountain and there are eight soldiers guardians from the Macedonian Phalanx around Alexander. The whole ambience is enriched by eight lions, two and a half meters high, of which four are facing the fountain and the remaining four lions are mounted on stairs, standing in the guard position. - Neolithic Settlement Tumba Madzari, Archaeological Open-Air Museum. Nothing much too see outside of the Old Town. The whole city was almost completely destroyed during the 1963 eartquake. Many buildings are in construction. Other sights are: Macedonia square, where a huge Alexander the Great statue was unveiled recently, the Stone Bridge, Kale Fortress, Memorial House of Mother Theresa, and the Millenium Cross on the hill overlooking the city: it is the biggest cross in the world standing 66 meters high. Worth a couple of hours stop on your way to Ohrid.